Jason Statham has always been kind of perplexing for me as a movie star. On the surface, he is everything I like in an action hero. He’s got great charisma and physicality, and he’s not half bad as an actor. Yet he’s never done a movie that I’ve been an unabashed fan of (though I did enjoy both Crank movies). Perhaps that’s because of the self-aware tone exhibited by The Transporter films. It probably also has to do with something that a friend pointed out to me a few days ago. Fans have become irreversibly jaded, to the point where we can no longer recognize anything but the highest of quality. Something simply being “good” is no longer good enough. It has to look and feel brand new, fresh off the showroom floor. In a world where there are no new stories to tell, that kind of thinking can be problematic. Statham’s latest offering, The Mechanic, has him in familiar territory. He plays Arthur Bishop, a professional assassin of exceptional cunning and ingenuity. When his close friend and mentor Harry Mckenna (Donald Sutherland) is murdered, he embarks on a mission to find and eliminate the culprits. Harry’s son Steve (Ben Foster) also seeks vengeance for his fathers murder, and approaches Bishop in hopes of joining him on his mission and becoming as adept an assassin as he is. Bishop reluctantly takes young Steven under his wing and imparts on him knowledge of the darkest and oldest art known to mankind: murder. 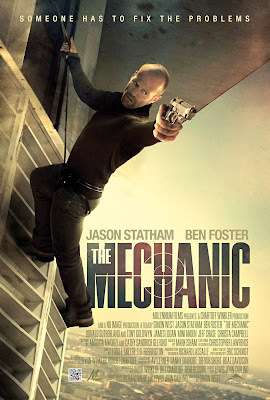 The Mechanic is remake of the Charles Bronson film of the same name. Though the red band trailer does display some humor (mostly in the form of wise cracks) it seems to take itself decidedly more serious than any of the Transporter films. The trailer displays some really novel kills, my favorite of which is a hit performed in an indoor swimming pool. There are lots of bloody surprises afoot, as the kill moves on display hit fast and hard. I’ve always liked that approach to modern action set pieces, as slow motion is overused and doesn’t always adequately supply the visceral kick such scenes require. The editing mercifully leaves the action coherent and clear. Is it bit sadistic to get such a kick out of watching people being slaughtered in increasingly clever ways? Perhaps, but hasn’t that always been the main selling point of movies like this? The hired gun who embarks on a personal quest is as much of a cliché these days as anything else in the action genre, Ditto for that hired gun taking a talented but seemingly reckless pupil under his wing. From a story standpoint, The Mechanic has nothing new to offer. However, like any good assassin knows, the method of delivery plays a big part in acquiring ones target. So does the element of surprise. The audience knows the hitman will get his target; the question is how and when. Those two factors make all the difference.